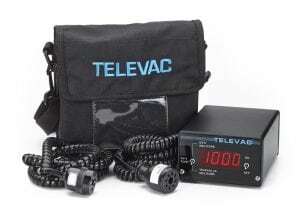 The Televac VacuGuard is a small, battery-powered, portable vacuum controller designed for use with Televac 2A thermocouple gauges or competing DV-4 and DV-6 series thermocouple gauges, giving it a vacuum measurement range of 1*10-3 Torr to 20 Torr, with a bright LED display that reads in Torr and mTorr (microns). The portability of this vacuum controller makes it ideal for cryogenic and industrial gas applications where the vacuum controller needs to be carried to different (sometimes mobile) tanks to take vacuum measurements of their vacuum insulation. The VacuGuard has a digital display, but if you’re looking for a portable vacuum controller with an analog display, we also have the B2A portable vacuum controller. B2A Portable – The B2A Portable is a small, portable instrument designed for use with Televac 2A thermocouple sensor. The B2A Portable is powered by a rechargeable battery for up to 40 hours of operation and includes a low battery indicator. The front panel consists of an analog display, power switch, and calibration control. While portable vacuum controllers are the best vacuum controller option for some applications, other applications are better suited for a rack/panel mountable vacuum controller or an active vacuum gauge where the electronics head is connected directly to the passive vacuum gauge (instead of with a cable). If you’re interested in a rack/panel mounted vacuum controller, a good place to start is the MX200. If you’re interested in an active vacuum gauge, check out the MX4A for low vacuum measurement (10-3 to 1000 Torr) and the MX7B for high vacuum measurement (10-8 to 10-3 Torr).